Spirit Island: Jagged Earth is currently up on Kickstarter (already funded). You can go to its page to see more details about the expansion. 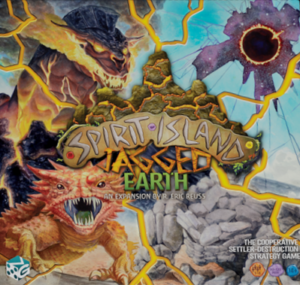 This Spirit Island: Jagged Earth preview was made after playing with the expansion three times. What is Spirit Island: Jagged Earth? Spirit Island: Jagged Earth is an expansion to the very popular area control co-op Spirit Island from designer R. Eric Reuss and publisher Greater Than Games. This is a big-box expansion that adds in new spirits, scenarios, island boards, and a lot of other stuff. 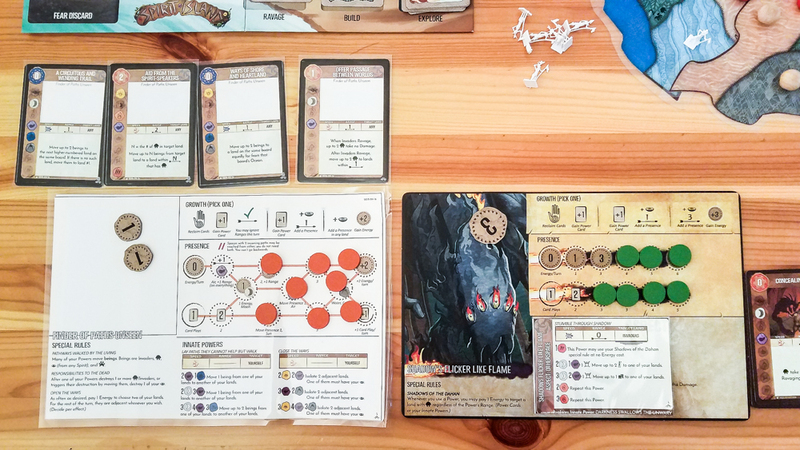 Read our Spirit Island review if you want to know how to play the game. 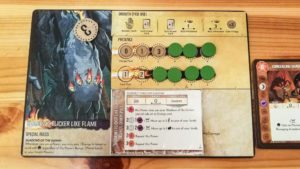 What’s New in Spirit Island: Jagged Earth? I’ve seen two of the spirits: Finder of Paths Unseen and Many Minds Move As One. Finder of Paths Unseen has a unique spirit panel and it really likes to move invaders around the island. It also has six starting powers. Many Minds Move As One is a defensive-minded spirit. It likes to create and move beasts around, causing fear all across the island. These boards serve multiple purposes. They give you more options for setting up the game and they allow you to now play with five or six players. 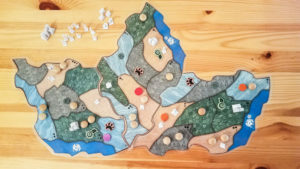 They are also going to include ways to do an archipelago setup, which will split the board into multiple islands. 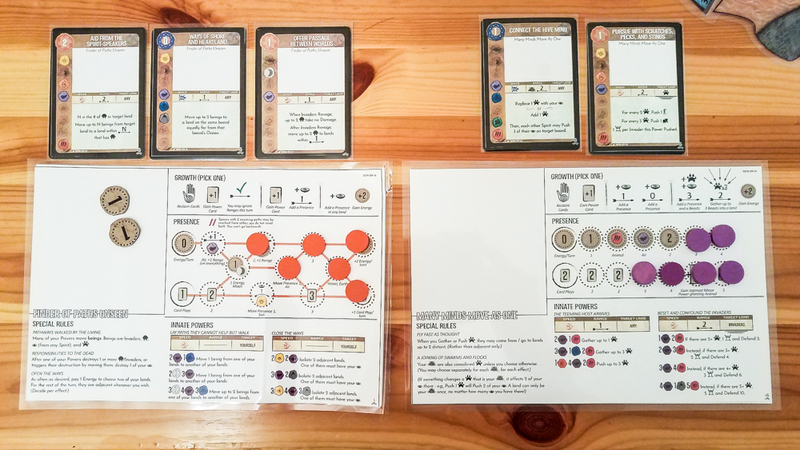 These allow you to optionally start the game with different Special Rules and/or Innate Powers when playing with any of the four low-complexity spirits from the base game. There are also going to be rules for combining two Adversaries. These give the spirits new ways to fight the invaders. Event cards were introduced in the Branch & Claw expansion. They add in some randomness to make the game a bit more unpredictable. I’ve only seen a small percentage of what’s going to end up in the Spirit Island: Jagged Earth expansion, so I can only comment on what I’ve seen so far. The two spirits that I’ve seen have very different play styles than any of the spirits from the base game. Finder of Paths Unseen is my slight favorite of the two because it can use its “move” abilities to keep the spirits safe and set up some nice attacks. I can’t wait to see the other eight spirits that they’re adding; that’s easily what I’m most excited about. The Aspects do just enough to make some of the base game’s spirits feel a bit different. They’re a nice bonus addition. 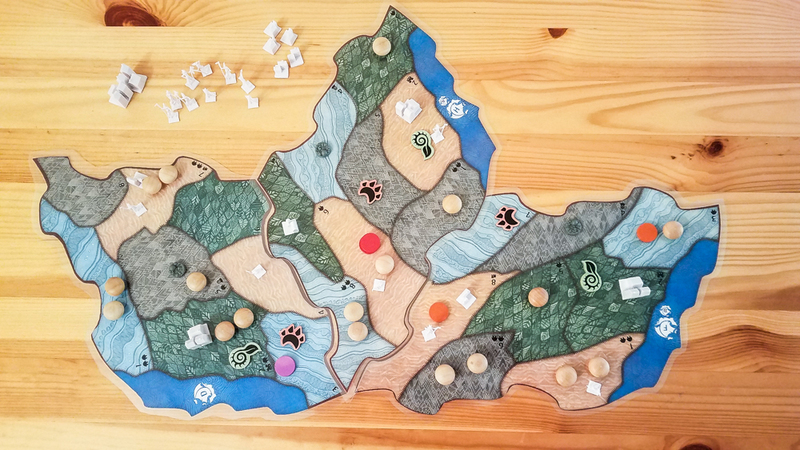 I don’t know that I would ever play Spirit Island as a five or six-player game, but it’s great that people will have that option. Plus, the new island boards give you more island setup options. The majority of the other content in the expansion—the stuff I haven’t seen yet—will be more cards to add to each of the decks. That can only be a good thing, right? 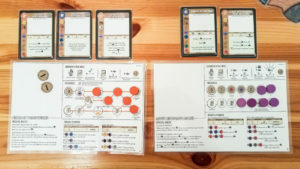 I’m not surprised to see so many people backing this expansion on Kickstarter. It’s going to give Spirit Island an insane amount of replay value. Thanks for taking the time to read our Spirit Island: Jagged Earth preview! To stay updated on all things cooperative board games, follow us on Twitter, Facebook, or via RSS.